Toy cars represent popular toys that can be found in most toy chests and daycares. Although they are meant to be used on floors and play mats, in this article you will discover 10 other ways to play with them. After all, there's nothing better than creating new activities using material we already have on hand. Use your toy cars as paintbrushes. Simply press the wheels in paint and let children roll them across large pieces of cardboard. 2)	Which ones go together? You will need toy cars and cardboard. Arrange your toy cars on the cardboard and trace the contour of each one. Have children associate each toy car to the correct shape. Use colourful adhesive tape to draw a long path on the floor of your daycare. Provide toy cars and encourage children to pick one they can drive along the path. Add tiny houses and garages along the path. If you wish, have children decorate cardboard boxes to represent these buildings and any other ones they wish to add along your path. Note: This is a great rainy day activity. You will need several small cardboard boxes. With your group, paint each box using a different color as part of an arts & crafts activity. Once the paint is dry, set the boxes on the floor. Children will enjoy rolling toy cars towards the garages they've created. Encourage them to associate each car to a garage of the corresponding color (example: a red car in a red garage). Draw large letters on 8.5 in x 11 in paper. Press the wheels of your toy cars in paint before using them to trace each letter. If you wish, laminate the letters so you can wash them off at the end of the activity and reuse them. You will need different sizes of toy cars, cardboard, and crayons. 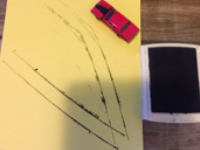 Encourage children to trace the outline of the toy car they prefer. Once this step is done, ask them to represent the car by coloring their car outline using the same colors and by drawing the same designs and/or writing the same words on it. When everyone is done, use their drawings for a simple association game. Children must try to identify the car each child reproduced. Fill a bin with soapy water and add toothbrushes. Let children add toy cars to the bin and use the toothbrushes to scrub them clean. If you want to turn this into a larger project, build a village with your group. Use colourful adhesive tape to draw a road network and include a tiny container filled with water to represent a car wash. Let children add to your village as they see fit. Draw a start and finish line on the floor. Have children move the cars from the start to the finish line, pushing them with a specific body part (nose, elbow, feet, blowing on them with their mouth, etc.). 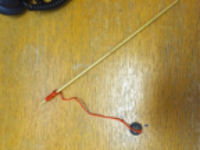 Use a wooden stick to create a fishing rod by attaching a long string and magnet to it. Use metal toy cars. Encourage children to attach the magnet to the roof of a toy car and pull on the fishing rod to roll it across the floor. 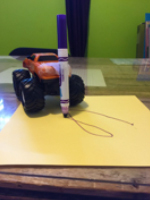 Glue a marker to the front of a toy car (see picture) and invite children to roll it on a piece of paper to draw.